Immerse yourself in history on a small-group, one-hour tour of the St. Louis Cemetery No. 1. 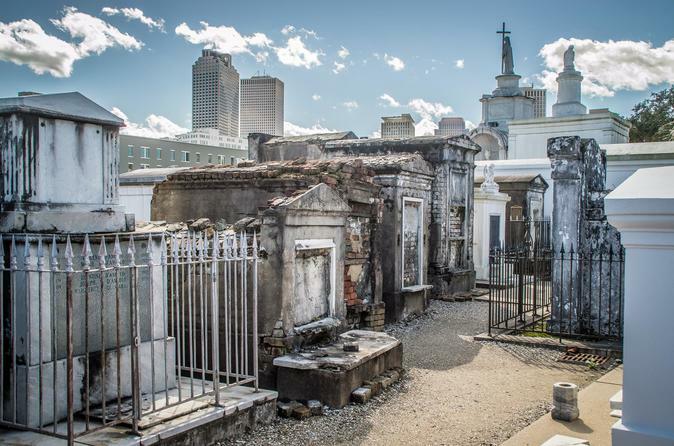 Learn about the history of New Orleans as you see the famous wall oven vaults and family and society tombs, we also discuss the famous people buried in the cemetery and the legends of Marie Laveau and Easy Rider. Meet your guide at the Visitors Center across the street from the cemetery and begin with learning about the geographical challenges of New Orleans. The city is primarily below sea level, including the major canals in the city designed to prevent flooding and the effects of Hurricane Katrina. Then, walk to the oldest above-ground cemetery in the city, St. Louis Cemetery No. 1. You are required to be with a guide in the cemetery and cannot walk freely through it without your guide. Hear about the original cemetery in the French Quarter and why it was moved. Discover the historical significance of it and the need to protect its architectural integrity. Discuss the burial processes, famous people who are buried in the cemetery, and see the supposed tomb of Voodoo Queen, Marie Laveau.